just breathing. 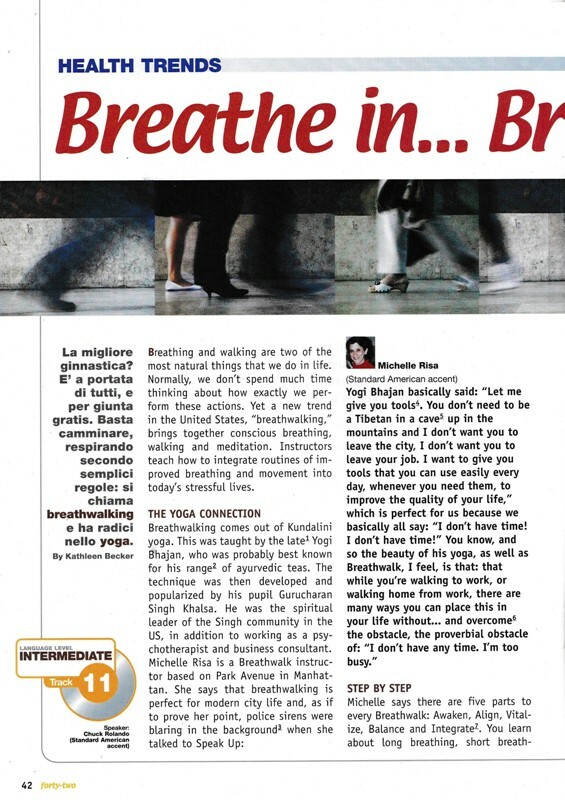 Yesterday in class we talked about how also everyone' breathing can be so meaningful. do you feel any necessity to be more capable of concentration? Why? 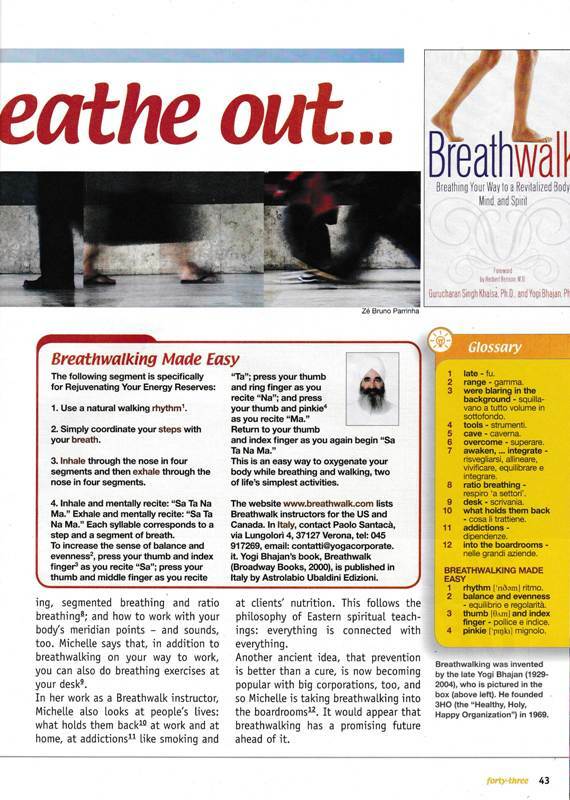 what could be breathwalking aimed at, according to you? do you live a stressfull life? are there only disadvantages in having a stressfull dayly routine? what are the tools you use to improve the quality of your life? if so, why is your life so stressful? any possibility to change it from being so stressed to being resourceful? any thinking of training your breathing this way? is made by single steps. 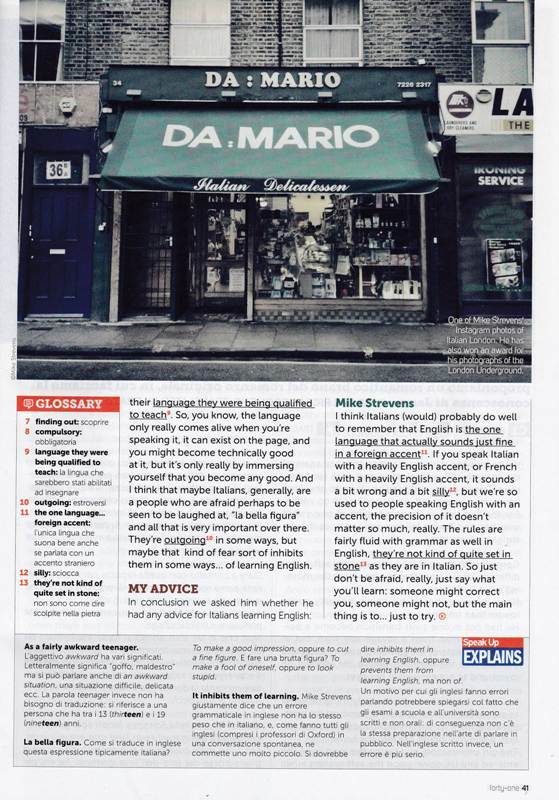 we could say so much about speaking English as Italians. If you acquire English as a second language, or third or whatever, it is one more identity you can add to your one/s. It allows your potentialities to surface, since so many other skills of yours were submerged and a second language is just the tool, sometimes it is just the excuse, to make you observe more, pay grater attention, listen more carefully, write to find out that there are accuracy and style, that can be transferred to your other languages; in case you are Italian, your mother tongue too can improve. Speaking too, giving any single word an intonation to accompany any speech of yours, becomes that enjoyment the way anything related to English is. It is that one more house you can have and offer to everybody, feeling at home wherever you can hear it spoken. Something in common, this feeling equal, and making the others feeling the same. Up to you to continue what English is for you, your past and present experiences, to let our readers know. It would be a pleasure reading them. 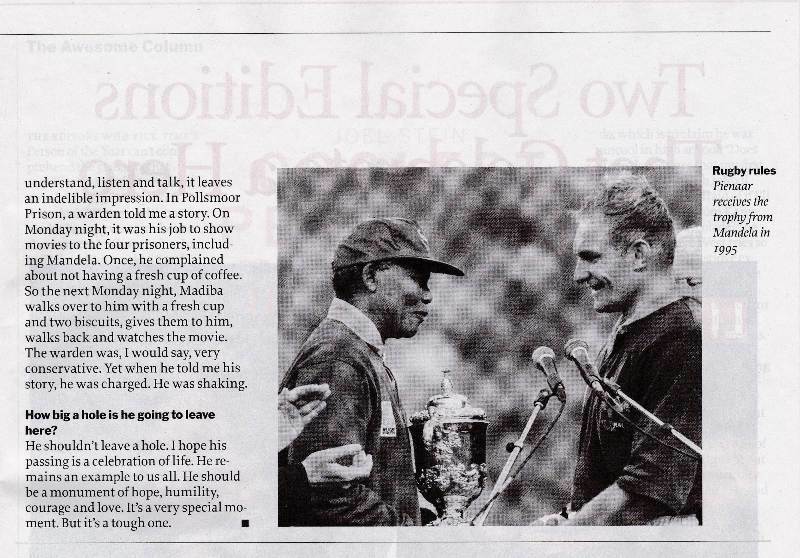 Comparing experiences, what is one of the best things Mike Strevens has ever done? Why? And yours? Why? He speaks about Italian teachers of English. What does he say about them and what is your general evaluation about English spoken in Italy? Where did you learn English? How long have you been studying it? What do you do to improve it? Does it work? How do you evaluate that? 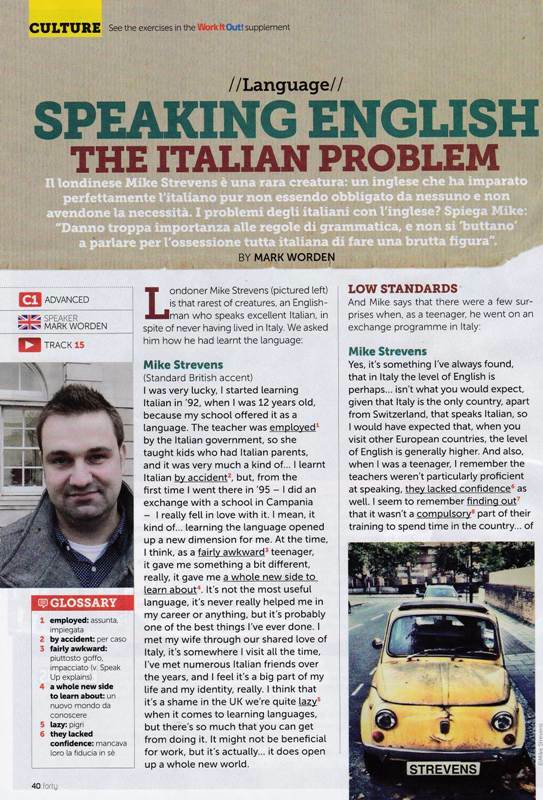 We think that Mike Strevens says something quite true about the common Italians' behaviour when speaking English. Integrating school classes' programs, we see that students tend to be afraid or ashamed to be laughed at, and be seen objects of derision by the others. We are convinced that the approach to a second language at school should consider it behaviour, not a subject. A language is a matter of life, a lifelong competence, a vehicle for any meaning you want to communicate and talk about. With the teacher acting in English, it should be perceveid as such. A language is you and your entire body, the way you feel at ease with it. Read the article, think of it, write a comment for us to read and talk about when back in class. 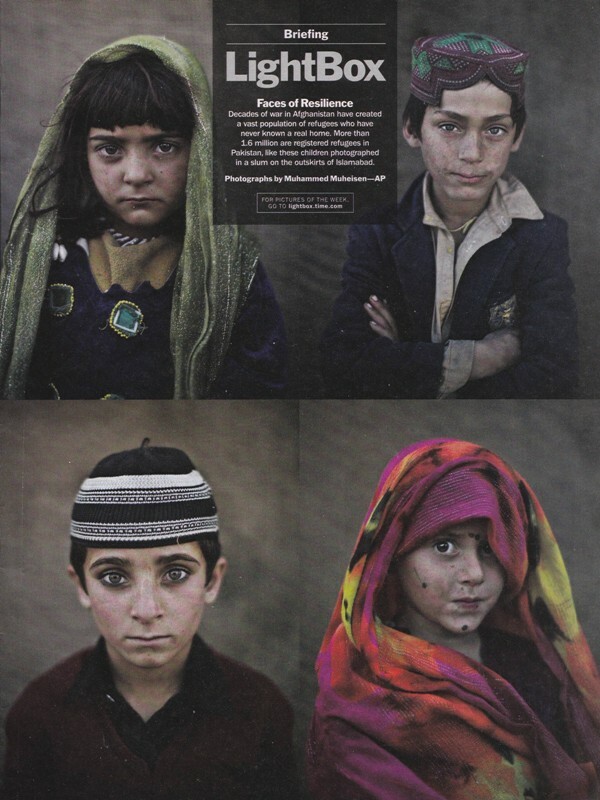 when children are asked to cope with war, when they experience anything else but war and fleeing from the war. Do they know that we are looking at them on protographs? Do they know that all over the world their faces are shown to make us think about ...........? What are you thinking about while watching them? Do you know what resilience is, in what diferent areas it is adopted and to define what? What are the infancy's rights? Are they the same the world wide? 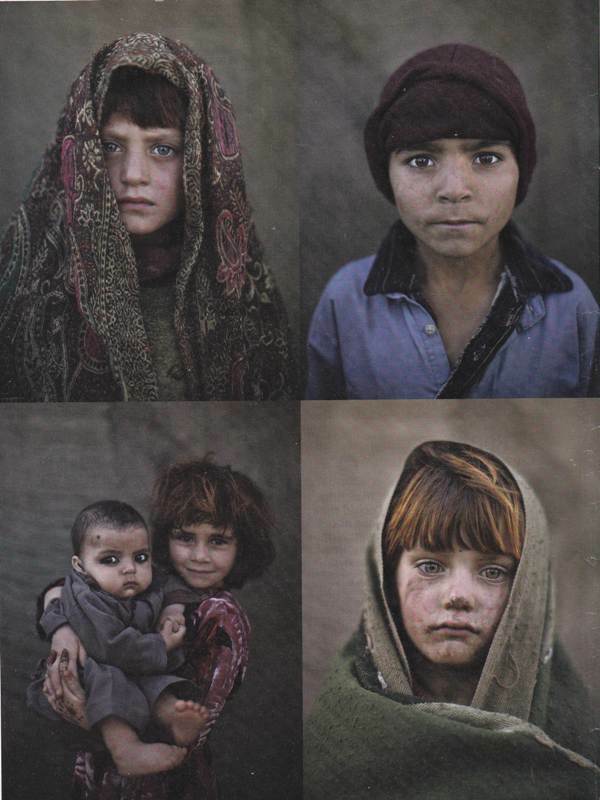 If anyone can draw, try to portrait these faces, each one expressing different feelings, one more way to pay the great attention they would deserve as human beings. Do you work as volunteers for some action? If so, let us know as a comment. If so,let's hold on and contribute to change even one life, gesture by gesture, word by word. It could make the difference for someone. 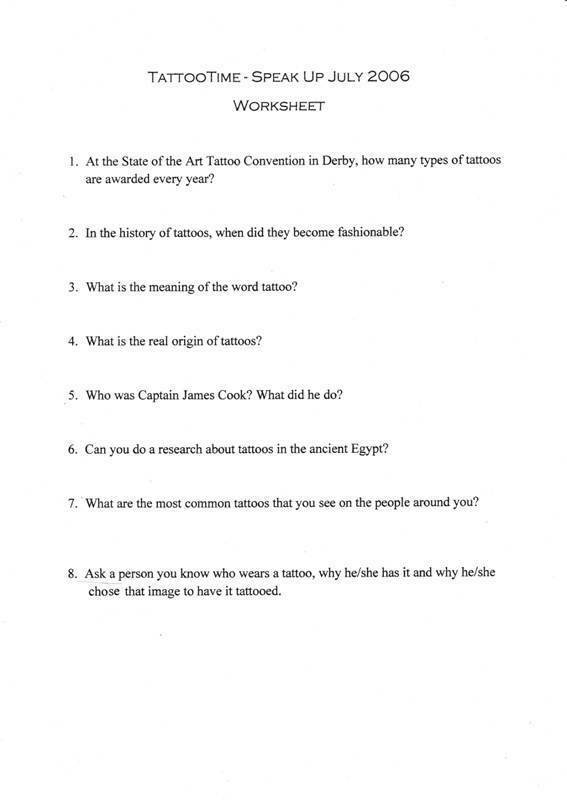 There is a class interested in tattoos. That is why we tried to find an article everybody can read and work on, answering the questions of the wowrksheet. It is good practice for your English. 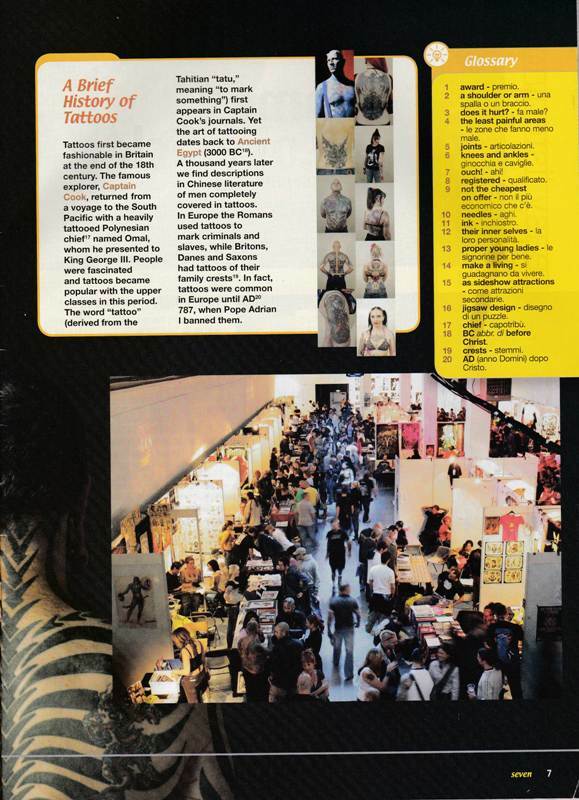 Agnese, Alessandra, Anna, Martina, Samuele, see you in class then, ready to talk about tattoos! after posting articles about films, Gravity won seven Academy Awards; we would also like to celebrate the Italian one, with The Great Beauty, by Film Director Paolo Sorrentino. We haven't watched it yet, since we would like to do it the way Americans did, with English subtitles. Below you have the link for the English trailer, on Youtube. It' important listening to the original audio of each film, and compare the two productions simultaneously, an ability you can develop thanks to just watching films and that can be of benefit in any other field. 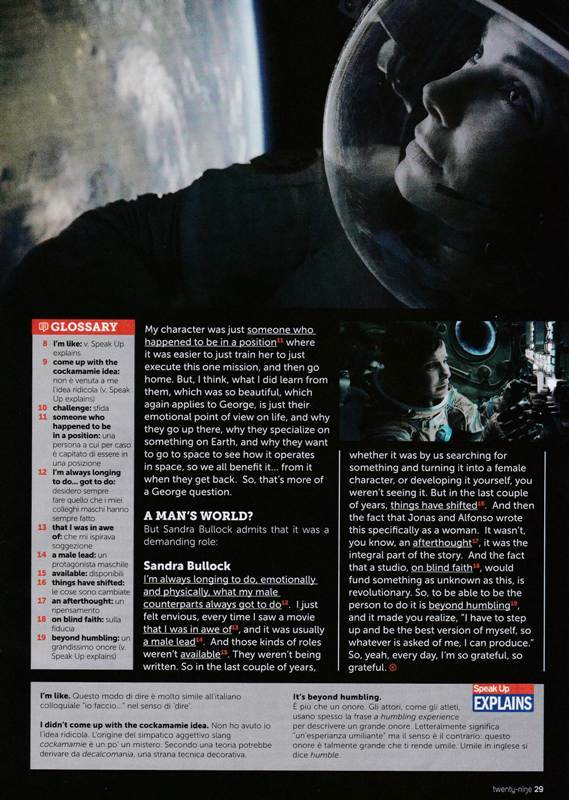 It would be so great of you writing your own comment about the film, there are so many different impressions! Enjoy cinema, enjoy English, practice it as much as possible, go to the cinema as often as you can! Karall: thank you for your articulated comment. We do agree the award has been also for Rome, that plays an extraordinary fascination on American people and whoever all over the world. If you were a student in class, there would be occasions for mastering grammar and sentence constraction. At this very stage, communication works and mistakes do not impoede comprehension. Rimas: we do adore visual language too, and any others. Thank you for highlighting how important it is to perceive all possible languages a film works on. The more we become aware of our perceptions, the more we can appreciate art. Eleonora: going to the cinema is fundamental, but in order to appreciate the quality of a film, I would say the inner disposition is important too. It's not the case of the great beauty, that's in Italian, but sometimes if you want to watch a film in its original language, you have to choose for a DVD or otherwise. these are two different articles at a more advanced level, and if you do not read what the level is, we think it is worth trying them. You can help your comprehension with the notes at your disposal. Two different solitudes in two films, the immense space and the vaste sea. 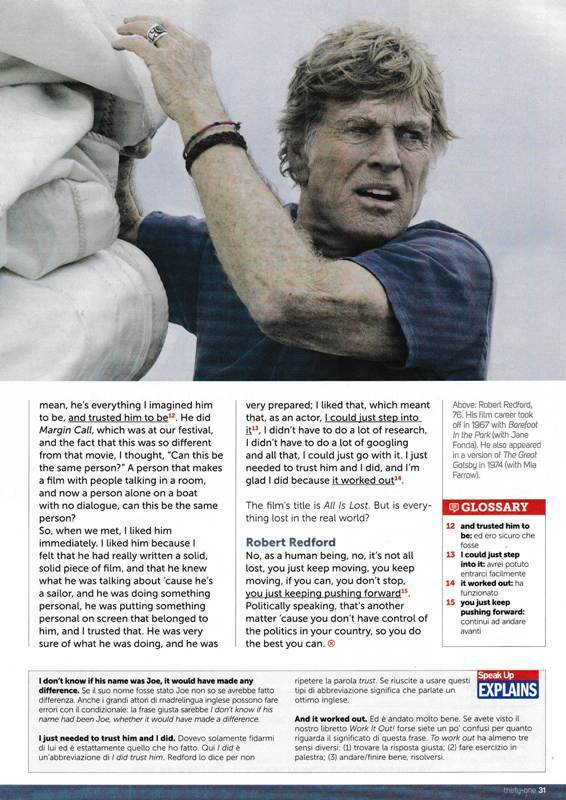 Robert Redford, a "solo" interpretation in All is lost, needing a unique experience as an actor, and it can easily be said as a human being too. 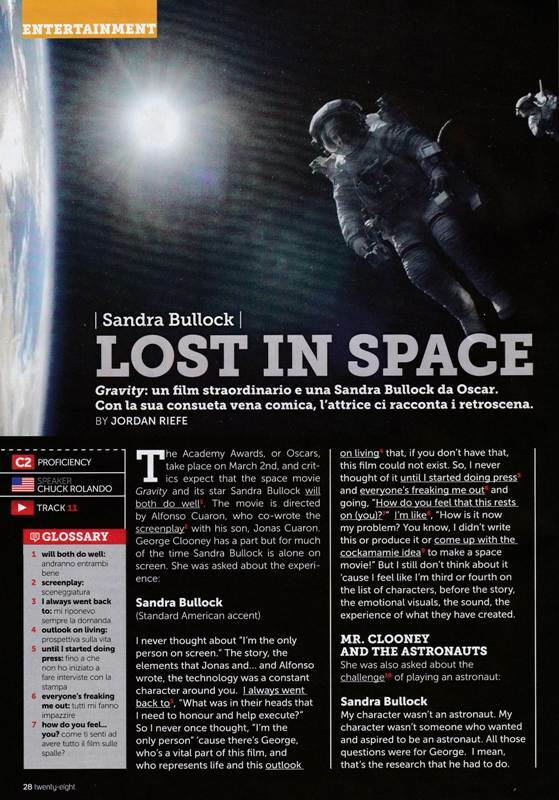 Sandra Bullock acting as an astronaut in Lost in Space that reminds us of real unpredictable risks when outside into the space like the one recently ran by the Italian astronaut Luca Parmitano. In the interview by Radio Tre we mentioned elsewhere, he was also asked about this film, and for sure, professionals' perception is different from common film viewers' one. 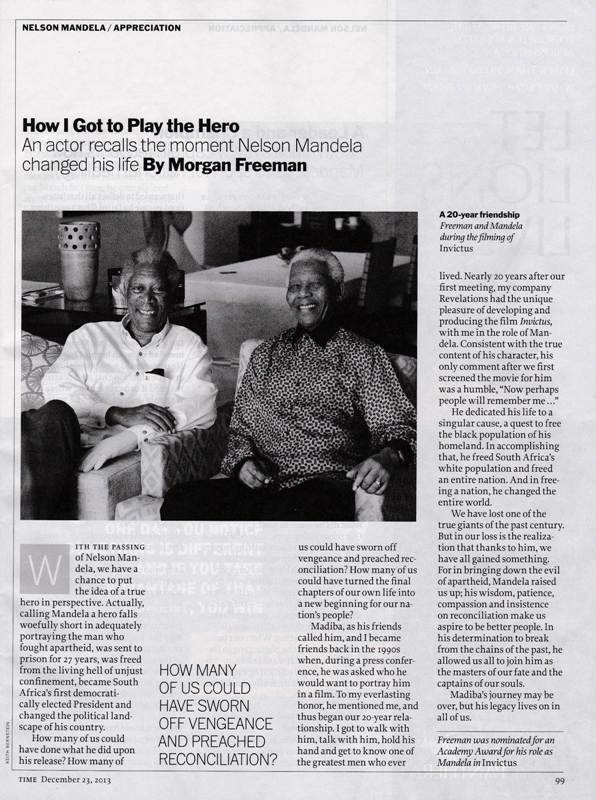 Actors have this possibility, to play roles as they were real life, to face other selves, and what about us? What can we do if we need to be different from how we commonly are? Do you ever feel this need? 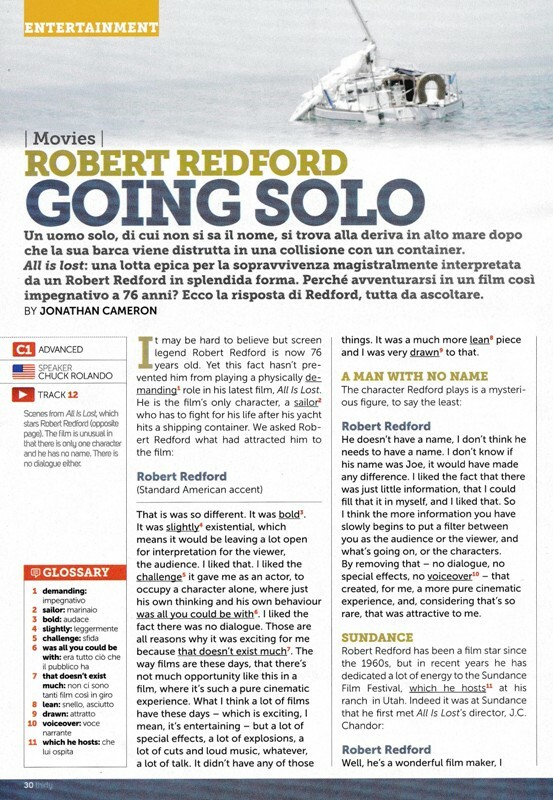 Try to write as a comment if you agree with Redford and Bullock, and what you would have done in such situations, or what you did if you ever found yourself as a "solo going" and where you had to "go". In case you have questions for the actors Redford and Bullock after reading the articles and watching the films, ask your questions here, we will do our best to have proper replies. Eleonora: films and films! How nice speaking about them! I have been on the set of a short film, but I would like to see how the whole set of a film works. How you go through scene by scene respecting the script to get the final result. Being a film maker is a matter of having great professionality, sensitivity, intelligence, skills. 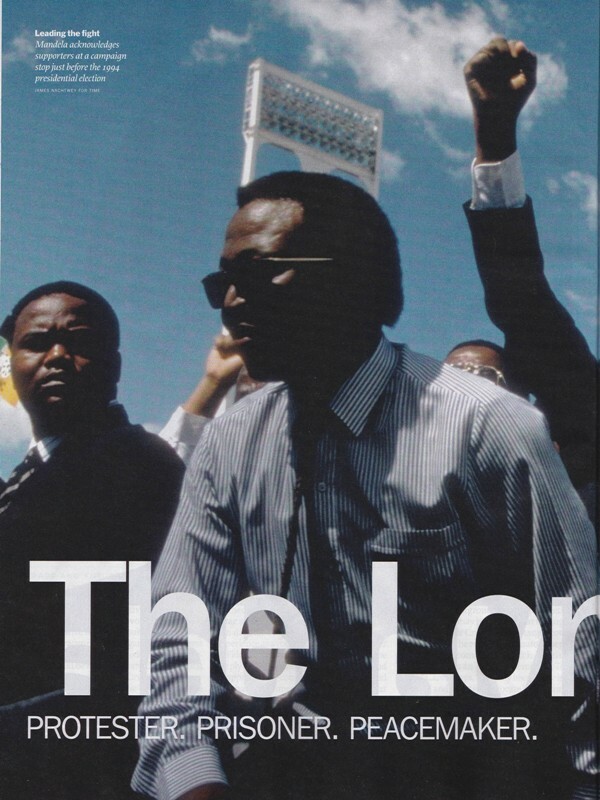 Cinema can play an important role in claiming human rights. Do not ever forget how meaningful is watching films also to acquire English. The context works with the plot, and images support delighting your interest. 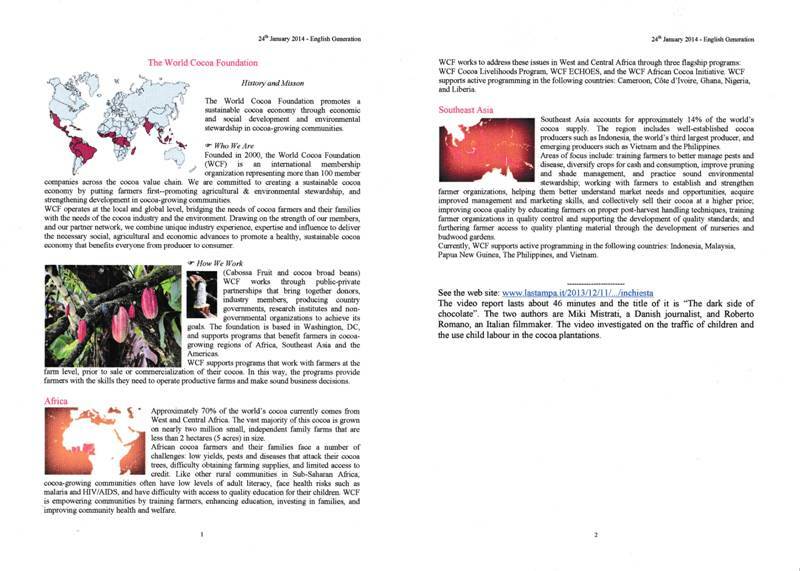 we tried to find an article at low-intermediate level, a few others are advanced level, they are for a next time. Trust yourselves, and very soon you all will be able to read them. It's impressive how so many times human life depends on a dog's one. 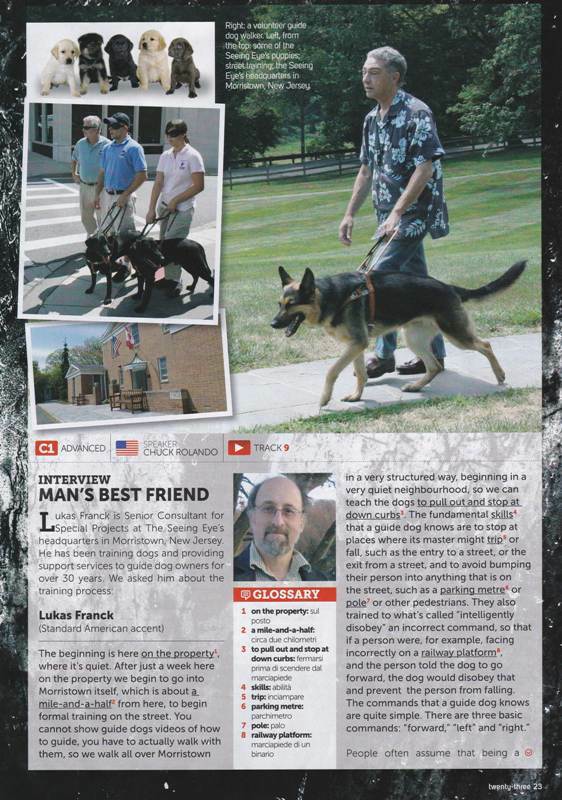 We found this article about guide dogs, "someone" we have to rely on when blind. Never met people who can't see? Never realized how many times we use expressions like "See you" and how kindly they reply? Never met people with guide dogs? Never spoken to them? What a sensitivity and fantasy they have, being capable of living in the dark, continuously developing strategies to cope with the reality they can't see. If you have anecdotes or stories, please tell us, we would be so pleased to know them. It would also be great to read your stories about your dogs, if you have any. You know, sometimes we talk about animals just to learn how to speak about humans. 1. What is "The Seeing Eye"? 4. 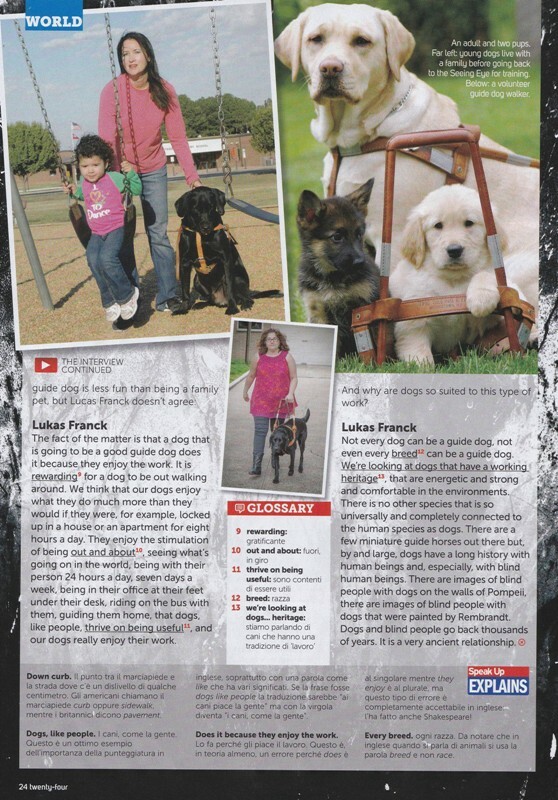 What breed of dogs are trained at "The Seeing Eye"? 5. How many puppies are raised each year? 6. What happens to an eight-week-old puppy? 7. What happens after that? 8. How long does the training last? Enjoy your English, very soon one more demanding text for everybody to read and practice on. See you in class. "Take the Lead" vs "Ti va di Ballare ?" search on the Internet and find information about Pierre Dulaine. Watch him dancing, with your families. 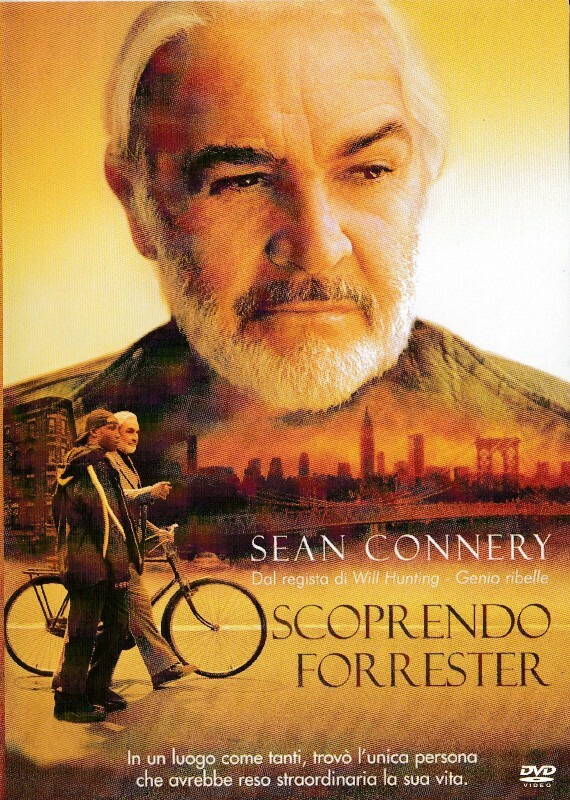 Then watch the film and focus on his method of teaching, his style, his communication. His ballroom dancing is a vehicle to change the lives of not only the young people who participate in his programs and classes, but also the lives of the teachers and parents who want to support these young people. Take the Lead was released in 2006 and depicts Pierre Dulaine's efforts to utilize ballroom dancing to help NYC youth to regain a sense of self-respect, pride and elegance. What is the meaning of the gentle command "Take the Lead"? What does it mean according to you? See you in class and don't forget, be the entrepreneur of your life, take the lead! 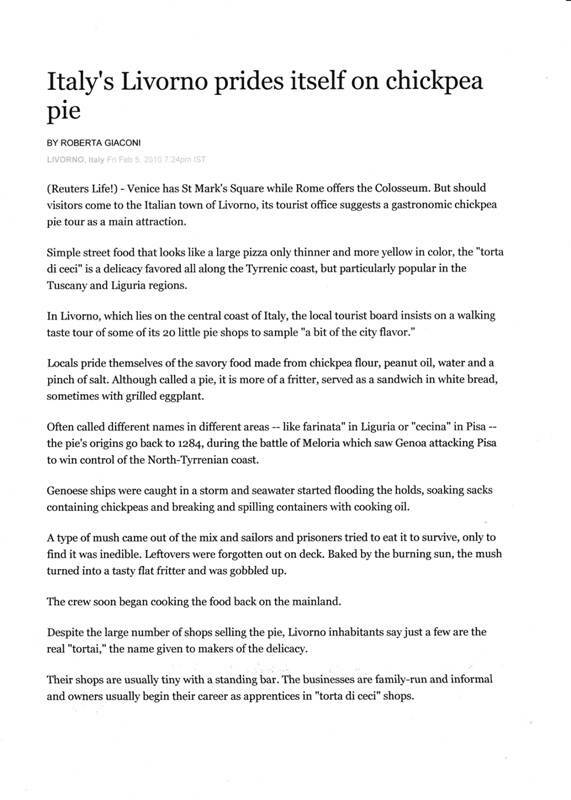 we would like to thank Roberta Giaconi's mother who came to class with this article about Livorno priding itself on chickpea pie after mentioning the very well known typical food the previous time in class, and Roberta for allowing such a useful use of her work, for our students. 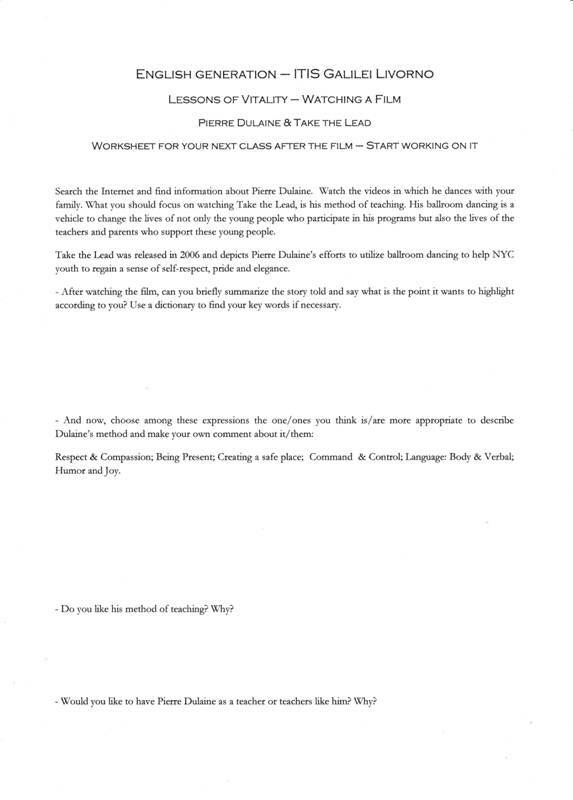 Read the article and the worksheet. Then reply to the questions. 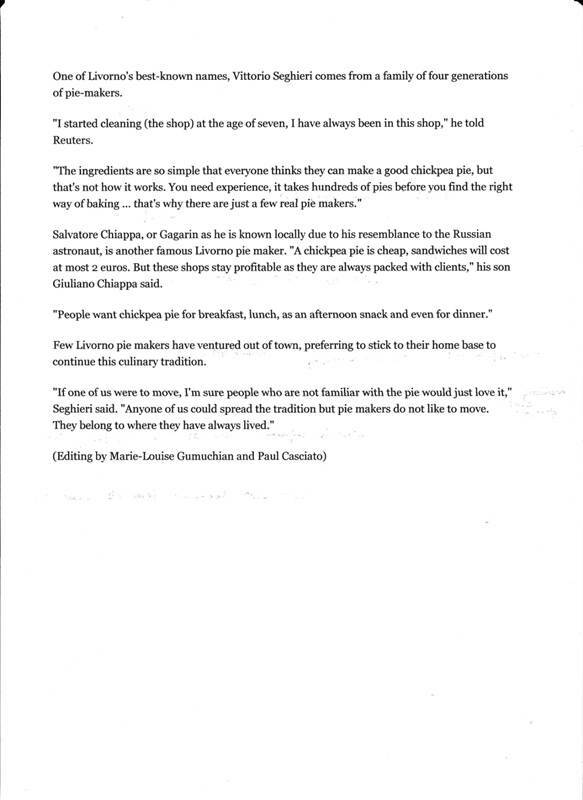 We are organizing a tour as a Lesson in the Open Air, ending with chickpea pie, all in English. Proud of that? There's more news for you to know, since the journalist Roberta Giaconi is coming to Italy from Australia, where she lives, and will be staying in Italy for a month. She accepted the invitation to visit Italian Students at ITIS Galilei in Livorno who are going to interview her about her profession, Australia, her life, her writing, her new book, to be presented this month in Italy. Why don't you write here a few questions you would like to ask her? We will publish the answers. Simona, Silvana and Fabio, Eleonora, thank you for coming to class offering mates your delicacies. 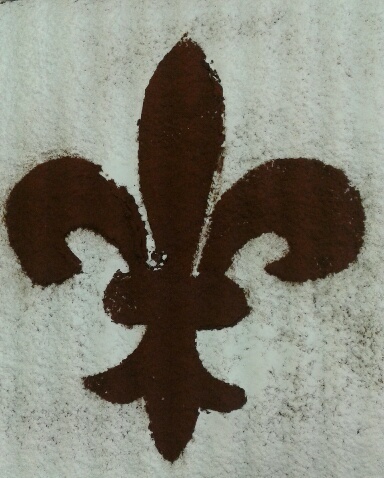 The foto of Florence's Lily is the decoration on top of Eleonora's cake, the Schiacciata Fiorentina. Enjoy Schiacciata Fiorentina and Chickpea Omelette too! 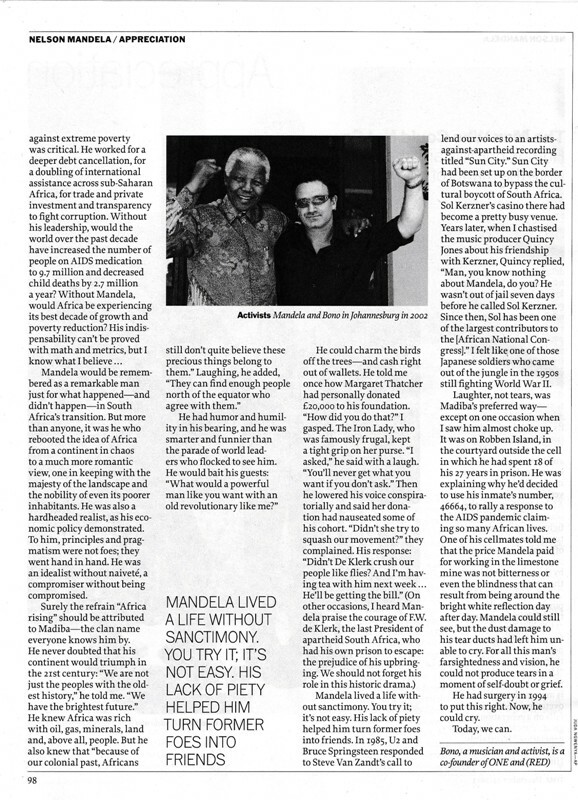 just a few words to update this article today, 1st December 2016, almost two years after publishing it. A film about Bob has recenbtly been released, with Bob playing itself. Nice guy! 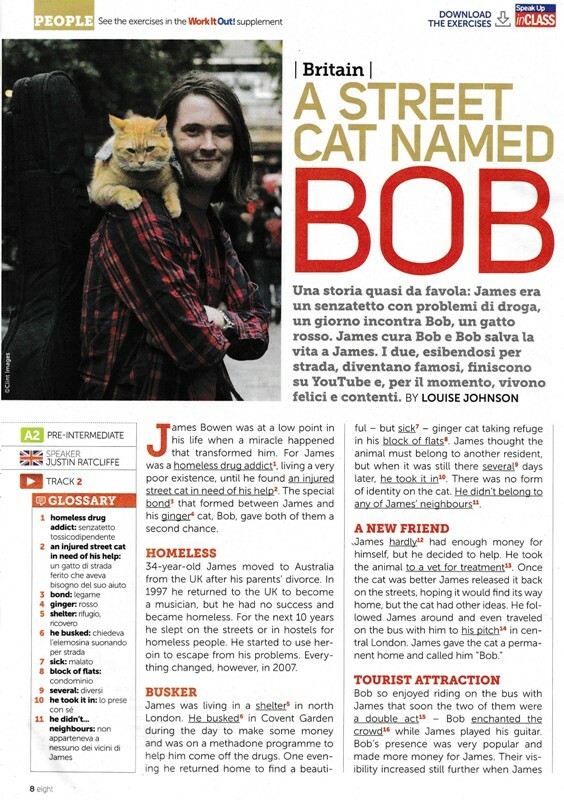 This is the story of a cat in Great Britain. Whoever loves animal can read it, reply to and ask questions to anyone else on the blog, through a comment. 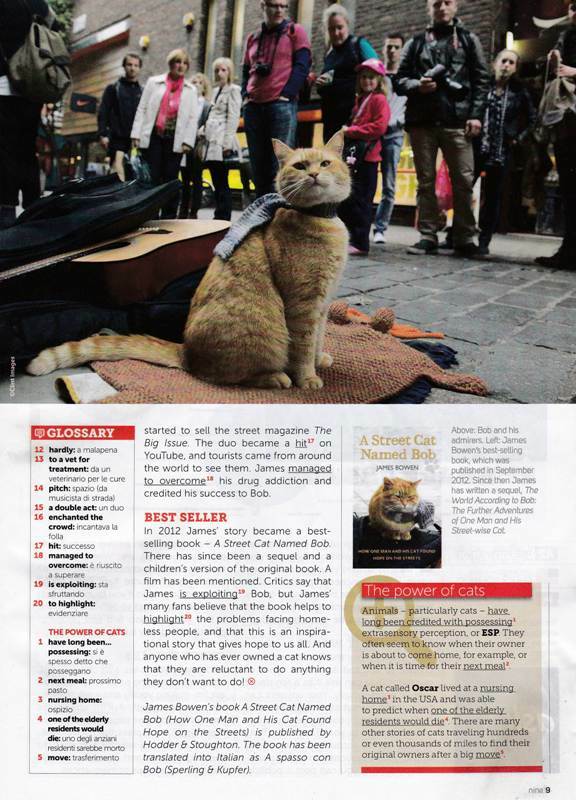 Have you read any other books about famous cats? For example Dewey, or Cleo? Do you know any others? 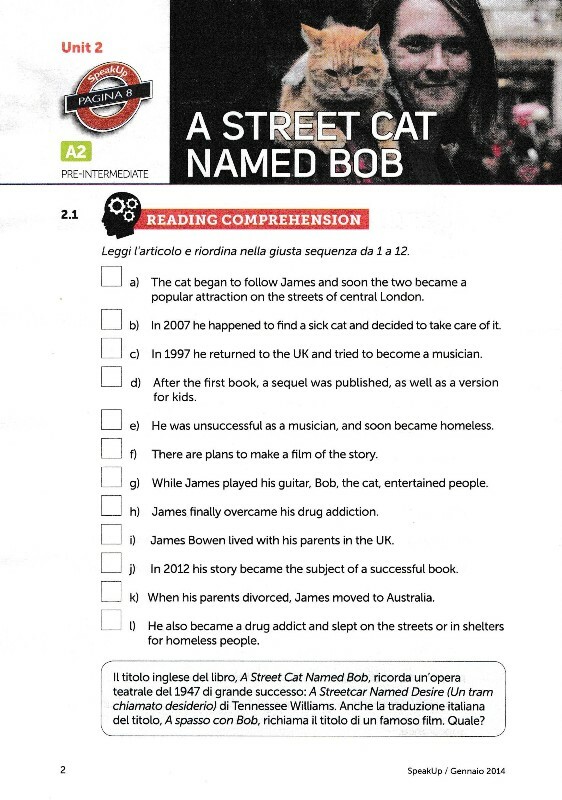 While you read this article at Pre-Intermediate level, can you search for the other cats'stories? Are they similar to this one? If so, w hat do they have in common? Which one do you prefer to tell us on the blog? Cristina: creative student, everyone can enjoy your story! Do you like chocolate? How often do you eat it? Today we want to talk about chocolate from two completely different points of view. The first one is seeing chocolate as an addiction. It is the angle of this text book we coped with in class. Grammar practice is about phrasal verbs. In these two paragraphs they are quite easy to learn and memorize. Do you know any other type of addiction? This page made us think about a reverse side of a habit we can develop without thinking of how cocoa is harvested to make chocolate. Not that you have to be a chocoholic to know about that. It's just information, very important to acquire in order to start viewing chocolate also in a different way. If you like having information about it do not hesitate to watch this documentary on Youtube, http://www.youtube.com/watch?v=7Vfbv6hNeng. We do think there's so much to know about other any reverse side of what we can easily perceive. We continue to ignore so many areas of the world and the peoples who live there. Maybe being informed makes the difference, and each one of us, in his square meter can behave differently. Check also how chocolate is produced from now on. Thank you Silvia for coming to class with one more side of it! Good news, fair trade! We invite you to write your comment about any type of addiction you may know, and how we could get rid of the "addiction" of seeing people not equal. What is the role of chocolate in our life? How can we consider it? Food? Nourishment? Have you ever visited a Chocofestival? Let us know and describe it. Thank you Cristina, Silvia, Marco and Sergio. It seems chocolate is quite an interesting and delicious topic! Any food when tracked back tells us so much about our history, civilization, and also unfortunately about people' exploitation. But definetely each one of us can make the difference choosing what's best each single time. No wine with chocolate? It might be Porto or Marsala you say, Sergio? I do think we should organize a proper celebration to see how well they match. Next time I'm coming to class with chocolate, let's see what happens then! I'm expecting some chocolate to be again in class then! first there's someone we would like to thank for participating in this blog, Samuele, who joined us with his comment about London Gliding. There is a very special reason why and we would like you to find it out; maybe interacting on the web you can do it. We are working hard these days, to develop projects and ideas. And you? Do you enjoy your English? We would like you to do that, also reading books. Here there is one among the vast variety we frequently propose our students to choose among. It is not a graded book, the type commonly students of English are invited to read, often as a part of their school program. If you can find the type of narration suitable to you, there are so many books of contemporary literature you can read; with the language level, also enjoyment can increase and reversely. Never stop reading and watching films. Be surrounded by English speaking and feel it as your second language, your second home. 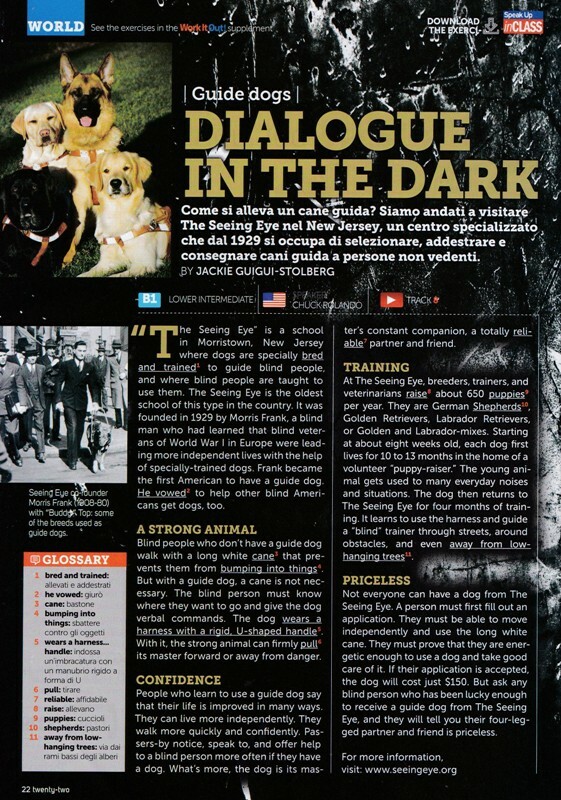 If you already speak other second languages - one could be Italian - then you are privileged, it is even easier. Let us know what you think of this book and others you are reading. Why did you like it? What is reading for you? And reading in English? gliding could be a new experience to start a new year. At least, just reading about it, related to London. Talking about this beautiful city, even more now with the Shard, have you watched any recent films with aerial shootings including this magnificent skyscraper that influences so much the whole panorama and the skyline? If so, let us know. We watched Closed Circuit, and there it is; at the beginning and at the end of the film there is Renzo Piano's magnificent creation. Gliding we said. This is quite an easy article everybody also among the students who started from a very beginner level in October can attempt to read. You can reply to the questions as a comment, after creating an account. Class time is always the opportunity to continue practicing about selected subjects. Do you remember where else recently we wrote/spoke about a cockpit? How can a glider reach the height of 2,000 meters and start gliding? What do gliders need to fly? What happens when a glider reach a thermal? What is a land out? How can you explain the glider pilot's idea in the article of having a "privilege" ? 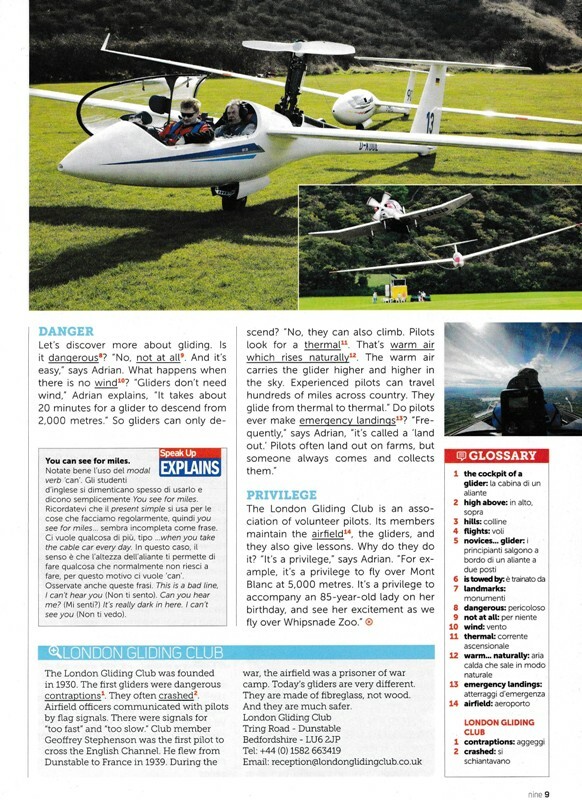 What is the London Gliding Club? 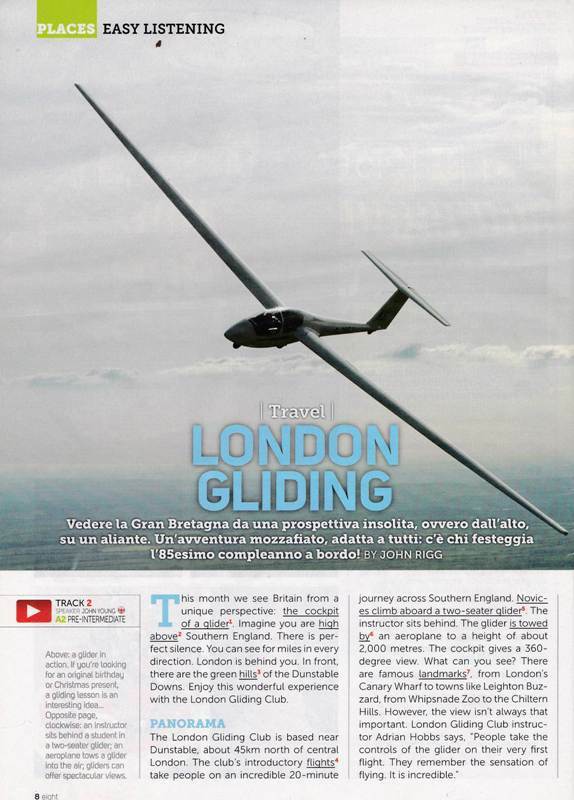 Wouldn't it be exciting viewing London from a glider? Shall we do it on our next visit to London? watching films in class is a great experience. We choose one as a "propeller" for ideas, evaluations. Have you ever watched a film in its original language? Ever thought that just watching a film in English means acquiring the Language? Try to concentrate and enjoy it; follow the plot, let the film fascinate you, let the Language do its work: leaving signs, memories, in a meaningful context. Train yourselves to pay great attention to both, listening and written comprehension and try to line them up. Your mind will do that for you, due to its importance if you feel deeply motivated. There are clever strategies inside ourselves, and experiencing is the best way to find out what they are and what results they can get for us. 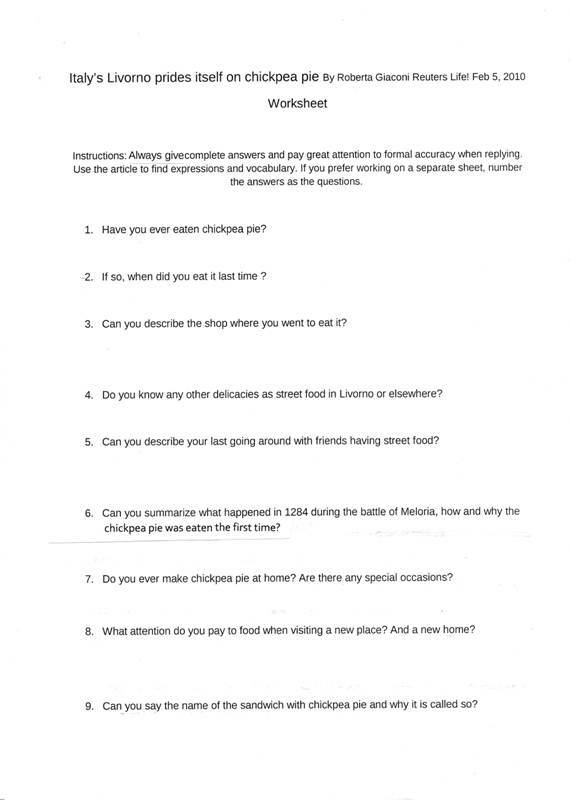 You have a worksheet here you can work on after watching the film. Reply to the questions either here as a comment or as homework before coming back to class. Quite late reply I'm afraid, Velma. It would be very stimulating for our pupils and students reading some more comments of yours and interacting, when in class, sending their own writings as a reply to yours. Keep up, looking forward to reading you again! Thank you Fabio, Homework Solution, Cristina and Giulio. Watching films is such an enjoyable resource to acquire a Language, cinema offers this great opportunity, living for a while in a different world and being not the same anymore, but richer. Last January we started our blog with "A Long Walk". Visit the Archive and find it. 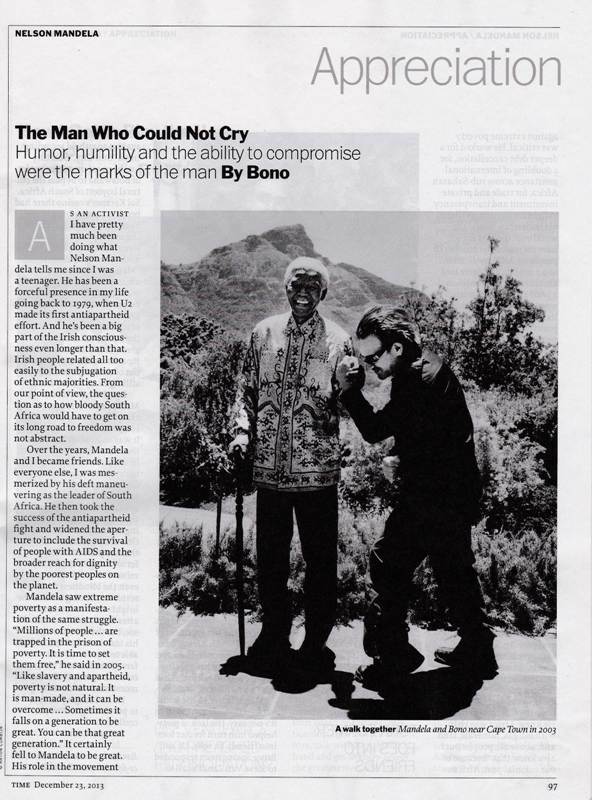 It's still Africa now, everybody's first home, with "The Long Walk", Nelson Mandela's one, saying good bye to one of its children. but we will continue to try. thank you so much for appreciating what is being done on this blog. The aim is spreading English as a tool for a worldwide communication, just talking or training pulils and students, any age, any profession. It would be great if you could participate, offering comments that could be used in class. Choose a subject you like, leave a comment, so that I can involve students here, and an interaction can start, mainly for students' benefit, but also for everybody's one.